Watching the Devastated Dreams campaign's progress. This thread is about following the progress of the Kickstarter campaign. People can link to places where they see the project received coverage too. Devastated Dreams was able to achieve the 2nd spot in the popularity ranking for the video games category. Shenmue 3 ends soon, so there is the possibility of grabbing the 1st position. Currently 286 backers have pledged $12,424. That is 10.07% of the $115,896 goal. The average pledge amount is $43.44 per backer, but that average should drop towards $31 per backer as smaller backers dilute it down. Here is the first set of graphs. Its rewards structure is performing as expected. The $10 early-bird tier is going to be more popular than the regular $15 tier. The early-bird $25 tier is going to be more popular than the regular $25 tier and regular $35 tier. It is still early in the campaign, but the $50 to $500 tiers are doing good. The $1 tier was able to bring in 9 backers. Kickstarter becomes less active at night, so that causes the curving to the individual rewards like the $10 tier. In the morning the growth should rise again. The $25 early-bird tier was able to bring in close to the amount the $10 tier that has over 100 more backers than the $25 early-bird tier. ● Sidekick is showing a 8% probability of success. This tool is often very pessimistic. ● Kicktraq shows an over-optimistic 183%. ● Bitly Analytics shows 90 clicks for the project shortlink. ● Kicklytics shows a trend line around $150,000. For exposure Eurogamer, PixelDynamo, GameInformer and Automaton posted articles. Daizoren Gaming, Octopinp and IndieRuckus uploaded demo playthroughs. There was a post to /r/kickstarter. Short-term goals should be to reach 15% funded this week (It may achieve that tomorrow) and 30% funded before halfway through the campaign's run. The project hasn't received exposure from big blogs yet, so its real momentum could end up much higher once more people are aware of it. It looks like many of the backers are those returning from Neverending Nightmares. While writing this I saw the project appear in the Staff Pick section. Re: Watching the Devastated Dreams campaign's progress. It's great to hear we are doing well! It is a bit scary being a the beginning of a kickstarter campaign, but we are off to a good start. Hopefully we can get a lot of repeat backers from Neverending Nightmares! 364 backers have currently pledged $15,981. That is an average of $43.90 per backer. $18,788 more in pledges and the project will be at 30% funded. $1,358 until it is 15% funded. 133 more backers until 500 total. The $1 tier grew by 8 backers. The $5 tier grew by 1 backer. The $10 tier grew by 52 backers. The $15 tier grew by 5 backers. The $25 tiers grew by 6 backers. The $35 tier grew by 1 backer. The $75 tier grew by 1 backer. The $100 tier grew by 4 backer. The $250 tier grew by 1 backer. The $1,000 tier grew by 2 backers. There is only 2 unallocated backers that didn't pick any of the reward tiers. The project was covered by Bloody Disgusting, Rely on Horror, Dirge Magazine, Cliqist, Indiegames.com, Gamespark, /r/videogames, GT Live, What a Horrible Night to have a Podcast, Wretic, /r/CrowdfundedGames, TheBrainDit and GermansnakeGaming. Hopefully coverage from places like Polygon and Rock Paper Shotgun happens before the $10 early-bird is over. The campaign did better on July 15th than it did on July 14th in the Bitly Analytics numbers. The campaign is hovering at the 3rd rank in popularity for the video games category. Shenmue 3 is in the top spot and has been doing another marketing push. They have a new trailer. It is getting a lot of coverage because its last 48 hours has begun. The Red Ash game in the second spot should get funded, but it is not doing too well. We are at 14.3%, so I expect we'll hit 15% today, which is a good milestone. We are still a ways off from 30%, but once we get there, I'll sleep a little better. Currently 417 backers have pledged $16,999. $386 more to go until 15% funded. The average is $40.76 per backer. I'd like to see the average stay below $40 per backer during the middle of the campaign. Staying too high indicates a lack of smaller backers. The project is maintaining the 3rd spot in popularity for the video games category. It is actually ranked 8th in popularity in the entire games category for active campaigns. Internal visibility on Kickstarter is not a problem. A quick post on Rock Paper Shotgun appeared. Other exposure was GameSkinny, JustGamingNews, KillScreen, Adventure's Planet, PlayM, /r/HorrorGaming, /r/CrowdfundedGames, BlackSilverUfa, GromGame and NeoGAF. The setting in the Phillipines and the monster were received well. The protagonist's stare is a bit strange. Let's Players that played Neverending Nightmares are hyped about the new project. There is a bit of confusion about if the game is a sequel. On the project page and with the coverage outside of Kickstarter, the number of comments is relatively low. Even negative comments can be better than no comments at all. If possible it would be good to brainstorm some ways to generate more discussion in the comments area. When people are commenting it means they are showing an interest. The $25 early-bird tier for alpha access was able to get around 20% of the backers selecting it when the reward tier was available. It was successfully from that perspective. From another perspective it under-performed because before launch it looked like it could do a few hundred backers (Filling 1,000 slots wasn't expected, more like 500 slots). That under-performance relates to the total number of backers being lower than expected for this point in the campaign. The second and third days had sharper drop offs in the daily numbers than I would have liked to see. Adding ""/backers" to the project URL brings up the backers list. It would be interesting to see how many backers were also backers of Neverending Nightmares. That could be checked manually, but I don't have the time to do that tonight. The Kicklytics page has a "Backers Demographics" pie chart to look at. 146 (35.6%) of the backers have pledged to over 50+ projects. 89 (21.7%) have pledged to 20 to 49 projects. Without having manually checking each backer yet, I think that pie chart is an indicator that many of the backers Devastated Dreams is seeing are from the 3,608 backers of Neverending Nightmares. Project creators have access to referral data to see how many backers are coming from outside of Kickstarter. The campaign is not performing badly, just under-performing for what it could be achieving. The press for the campaign has been spread out a bit instead of concentrated. It is easy to get over-optimistic about how many backers from a previous campaign will return, but I expected to see more backers from Neverending Nightmares. There isn't a Greenlight campaign to generate views. The launch was a bit close to the end of Comic Con. 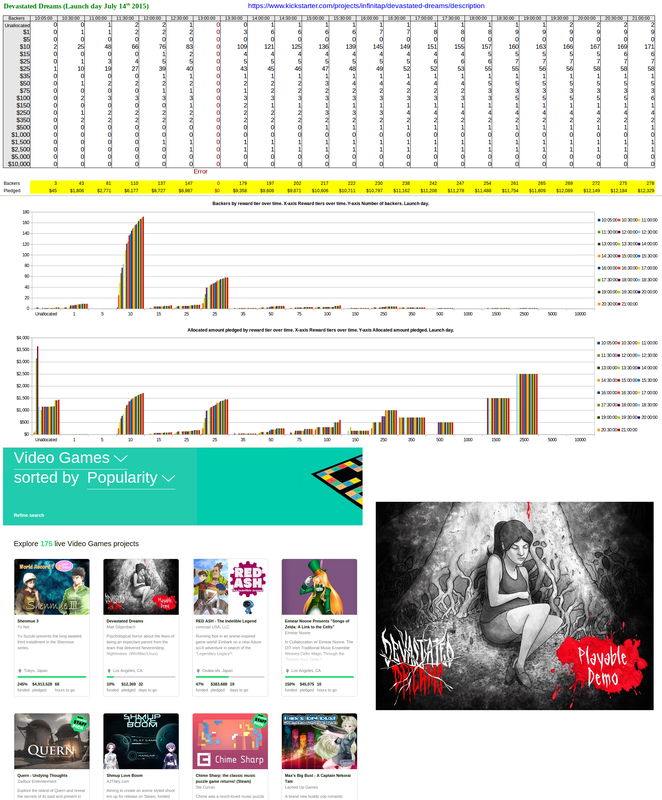 A potential problem is that while there isn't much competition in the video game category, that also means there aren't many good medium sized projects bringing in a lot of traffic to the category. The final day of Shenmue 3's campaign may boost other campaigns as well. It looks like a repeat of needing a final last week push to get to 100% funded. For that to happen there is the short term goal of reaching 30% funded before halfway. I plan to upload new graphs tomorrow. I agree that the drop offs for days 2 and 3 were lower than what I was hoping for as well. I'm also surprised that we haven't gotten more repeat backers yet. We went through the numbers earlier today, and out of 433 backers, 273 (63%) were from Neverending Nightmares. While almost 2/3rds of the backers sounds like a lot of backers from the previous project, it's basically less than 8% of the total backers from Neverending Nightmares, which is surprising to me. I was under the impression that more people would carry over because I thought everyone was pretty happy with our game and how I ran the campaign. I sent a wrap up email to the Neverending Nightmares project via Mailchimp just now since as of Monday, I got another person who didn't know how to redeem the key, so I figured maybe people don't see the updates. It'll be interesting to see if that helps drive more traffic to the project. I've noticed some campaigns (Double Fine and Underworld) use Mailchimp for some backer communications, so maybe I should consider that updates aren't the best for key information like how to get the game and whatnot. Do you think it would have been better to do a Greenlight campaign? I think it helped on Neverending Nightmares, but I suspect saying we can distribute on Steam off the bat is a nice too. Also, I think Greenlight has declined in the number of people who check it out now that it is old news and honestly kind of reviled. I would have thought that not having much competition would come in handy, but perhaps you are right in that there aren't a lot of people viewing the project. We haven't gotten a significant amount of backers through kickstarter itself (other than the search, but they are already looking for our game at that point). I'm doing my best with my press connections, but I haven't had too much luck with the big sites. I wonder if they are more reluctant to cover campaigns these days? It is definitely going to be a challenging campaign, but at least we are still in good shape. Is there anything that you think I should be doing differently? It also has comments like: "they should work on animation again but it could be fun"
Thank you so much! That is awesome! I REALLY appreciate it! We are working on improving the animation, and at least the facial animations have gotten way better since the trailer. He wasn't aware through the whole playthrough that you could move the flashlight, but still somehow managed to get the first door unlocked. I'm not sure what else you could do at the beginning to make people aware they can move the light, maybe some are just going to miss it? It may not be a common thing though. He has some critical but nicely worded feedback at the end. Currently 506 backers have pledged $18,303. Both 15% funded and 500 backer milestones have been reached. $16,466 more and the campaign will be 30% funded. 30% is one of the biggest milestones because of how greatly the chance of success improves. The average is now $36.17 per backer. A note is that $15 priced games on Kickstarter (For the non-early-bird tier) can often see an average around $31 per backer. To get to 100% funded the campaign could be looking at a total within 3,219 to 3,738 backers. It already has 506 backers, so it would be an additional 2,713 to 3,232 backers. Those totals are achievable. It is not like the campaign needs over 10,000 backers. A reminder is Neverending Nightmares had a total of 3,608 backers pledging $106,722. Devastated Dreams was the first project listed in the Kickstarter Happening newsletter for Friday. That was very good. There was also exposure from Digiminded, PCGames.de, PCGamer, IndieMag.fr, dlive22891, RaedwulfGamer, /r/gaming and 14 really small YouTube channels. Bitly shows a big chunk of clicks from Dlive on Friday. I am wondering if information from the developer diary videos isn't properly getting to the majority of backers. This may be an explanation for why the rate of comments is lower than expected. An example is diary #12 shows 60 views when writing this. Time codes and a table of contents for what is in the video may help. More images in updates or content that can be read on a mobile phone's e-mail app may be something to consider. July 17th did better (85 backers) than July 16th (51 backers). The $10 tier is growing well. This is the important tier to watch while it is available because it is what many backers are going to pick. The $100 tier did well on Friday. The normal $25 tier saw more backers after the early-bird $25 tier closed. The $10 early-bird tier ends on Tuesday July 21st. There is currently 2,670 of 3,000 slots remaining. It looks like the time-limit is what will close the early-bird. Something to debate is the pros and cons of slashing 1,000 or 2,000 slots off the $10 tier. Backers could be reminded to tell their friends about the campaign before the early-bird tier ends. This campaign is about to endure its first weekend. Next week will be interesting to see if any large campaigns launch.